Many people suffer from dental problems which impact the look of their teeth. It can have a negative effect on our self-esteem. Do you find yourself stopping your smile before a photo or covering your mouth when you laugh? Dentalspa Geelong offers a fantastic range of Cosmetic dentistry services. If you suffer from chipped, broken or stained teeth, porcelain veneers will provide you with a beautifully restored, natural smile. Porcelain veneers also offer a solution for discoloured teeth unable to be treated with whitening gels. 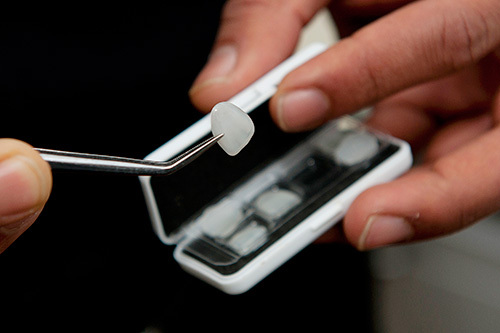 They can be used in cases to close gaps between your teeth and hide oddly shaped teeth. Porcelain veneers are a custom made, thin, tooth coloured porcelain shell, bonded to the front of your tooth to create a natural smile. Dentalspa Geelong offer several veneer options including ceramic veneers and composite bonded resin veneers. The confidence and happiness you feel with your restored smile will be incredible. Dentalspa Geelong wants to help you achieve the natural smile you have always wanted. Dentalspa offers complimentary veneer consultations so that you can discuss which option is best for you, call our friendly team on (03) 5223 1555 to book your consultation now.